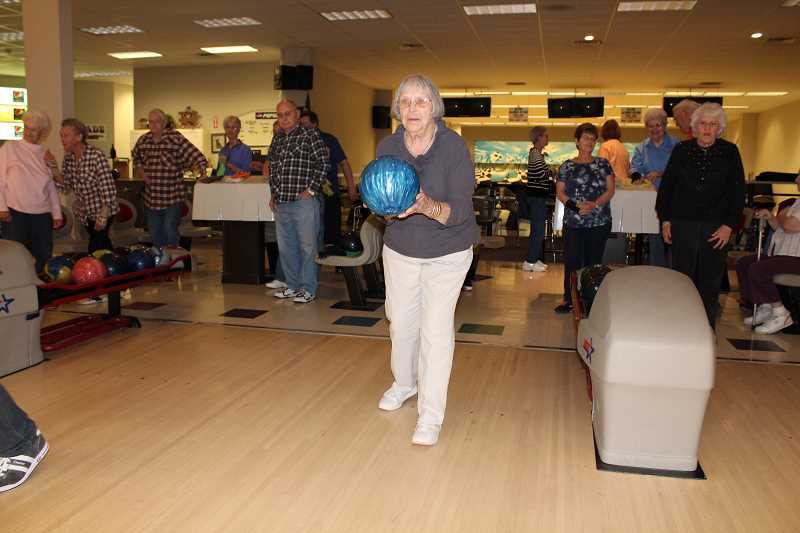 People in the local Senior Bowling League aren't real serious about bowling — it's just for fun. That's what one fella pointed out Tuesday afternoon at Rimrock Lanes, where a close-knit group of around 50 seniors meet to not only bowl but to catch up with their bowling family. "It's such a neat family atmosphere. Everybody feels like you're just part of one big family," said 75-year-old Betty Woodward, who joined the league back in 1995 when she was 52. "The majority of our members are 70 or more. We have one lady that's bowling with us that's 95." The bowlers don't know — or can't remember — when the Senior Bowling League formed, but the best guess is sometime in the 1980s. "All the ones that would have known are gone," said Woodward, who has served as the league president for about five years and makes the weekly trek from Mitchell. The Senior Bowling League season begins at Rimrock Lanes in Prineville each September and runs through April, consisting mostly of Crook County residents with a few from the Redmond area. This year, there are 10 teams with four people on each team, and a few subs. They meet at 1 p.m. each Tuesday. "They try to pick two high bowlers and two low bowlers," Woodward said, adding that the teams are different each season so people can get to know everybody. "There's a rule that we have that husbands and wives can't bowl together." Belva McCullough, who's been part of the league for 21 years, says she likes that rule. Recently widowed, she says she doesn't feel like the third wheel. The 79-year-old loves the relaxed atmosphere and the camaraderie. "We aren't as competitive as we used to be," she laughed. "I bowled a lot better when I was 60 than I do at 79!" "We've all slowed down," Woodward added. "People will come up to us and ask if we've ever bowled a 300 game. Well yes, we bowl 300 games every week — it just takes us three games to do it!" Lois Shepard, also 79, said they're all just happy that they can get out of bed and can throw the ball down the lane! She joined the league in 1996 after she retired from teaching and served as the league secretary for 15 years or so. Shepard recalled the first time she bowled was as a substitute. "The first four frames on both teams, everybody either had a strike or a spare. I thought, 'My goodness, these guys are good.' I was the sub, and I thought, 'Oh, I don't know if I can keep up with them,'" she laughed. These days, she says she bowls decent — nothing fabulous. Originally from New York, Hank Mahan moved to Prineville in 2004 after he retired and joined the senior league a couple of years later. He's been bowling since he was in high school and is now the league treasurer. Across the alley, 90-year-old Lois Zehrung says she started bowling in Baker about 60 years ago and joined the local league when the bowling alley was at Second and Beaver streets. At 95, Shirley Hoefle is the oldest league member, and she says she likes the people she bowls with. "We have to help her once in a while, but bless her heart, she's there and bowls every week," Woodward said. "She still enjoys it just as much as she did when she started." 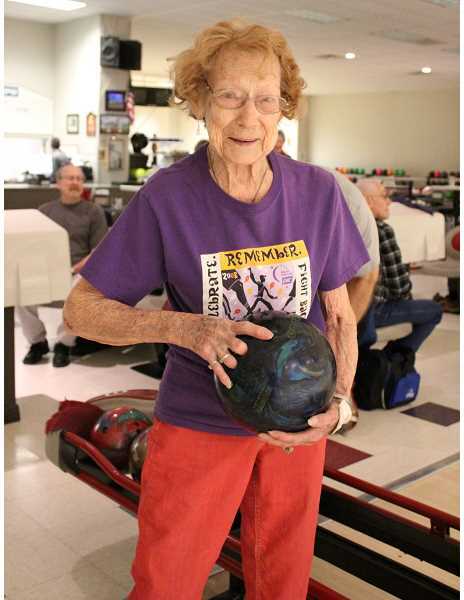 Then, there's 91-year-old Norma Jones, who took up bowling in 1957 as a "Mom's night out." Now, she enjoys seeing old friends and being out and about. "I'm not the oldest on this league — I'm the next to the oldest," she laughed, adding that she also plays in the Thursday night Juniper League. She calls her 137 score mediocre. "I was never really good, but I did have at one time a high 160, low 170. So I was pretty good back in my youth. I've never had a 300," Jones said. Last year, she competed in the state tournament in Bend, and along with a few others in the league, has earned a spot in the United States Bowling Congress Hall of Fame. Woodward recalls the time about 20 years ago when she won the state single championship in the division three level. The tournament was held in Eugene that year, and she was competing with other seniors on the first day of the two-month tournament. "We bowled doubles, and I bowled a 90 one game that morning. I was so humiliated I could have just crawled under the carpet. So when we went to lunch, I told those girls I am going to show you that I can bowl," she recalls. That afternoon, they were bowling singles. "I went to the state tournament with 129 average, and I bowled a 199, a 204 and a 224," she said, adding that the scorekeeper told her those numbers wouldn't get beat. "I sweat blood for two months, waiting to see what was going to happen, and when it was all over and done with, I had won the state single championship in the division three level. … That was a feather to my bonnet." 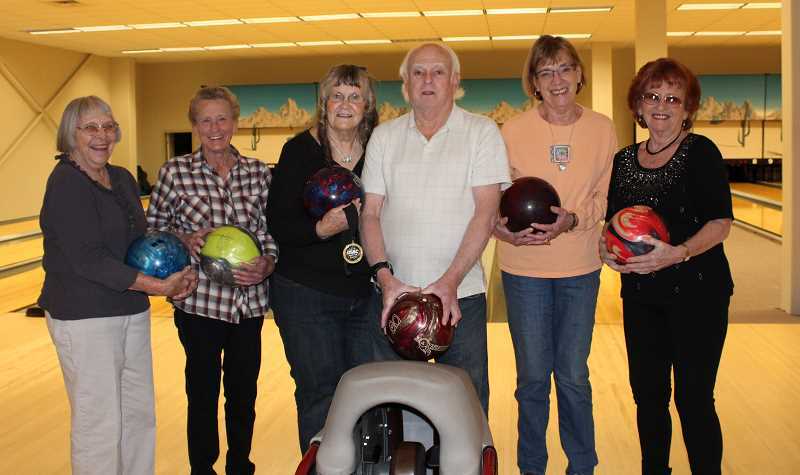 The bowlers say they welcome more seniors to join their league — the only requirement is to be at least 50 years old. "You can't ask for a nicer bunch of people to bowl with," Woodward said. "It doesn't matter whether we bowl 60 or whether we bowl a 300 game. It's just fun."